As is typical of veterans who served in Vietnam, I have some recollections of the experience that are memorable and some that are not. There are memories forgotten or lost for good reason and some recalled with much fondness. This snapshot of the past is one of those recalled with much warmth. During the last half of my tour in Vietnam, 23rd Group Artillery came down with an order that the 6th Battalion, 27th FA was to provide a Forward Observer (FO) team from each firing battery. These FO teams were to be assigned to infantry units that lacked the manpower to staff their own FO teams. The FO that was “volunteered” from my battery was the most junior FDO, 2Lt. Terry Harvick. Since I had a fair amount of “time in country” and was not a senior EM in my FDC section, I was available to fill the reconnaissance sergeant’s slot in the FO team. I was reluctant to volunteer but Terry was having a hard time trying to find a volunteer so I decided to help him out and I accepted the assignment as recon sergeant. All that was left was to find some poor soul to serve as Driver/RTO. We found him in the “happy-go-lucky” Bill Knapp. I can’t remember from what section he came from but it was one that did not use a radio so I had to give him a quick class in the operation of the FM radio and proper radio procedures. We scrounged up some “web gear” and off we went. 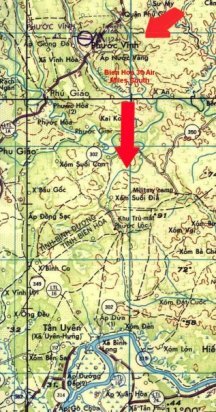 After a short orientation at Phouc Vinh, home of the 3rd Brigade, 1st Cav, we were assigned to Delta Company, 2nd Battalion, 7th Cavalry and were transported by supply chopper to join Delta Company in the field. 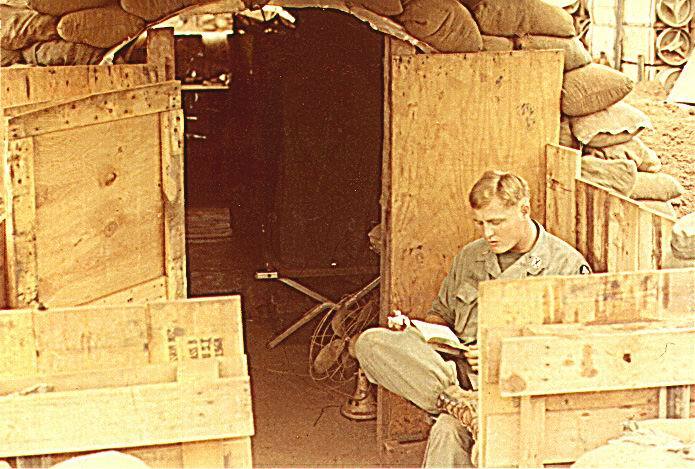 We spent some time working from an un-named FSB for a few days before participating in the teardown of the firebase and the relocation of Delta Co. to Cu Chi for further orientation and assignment. 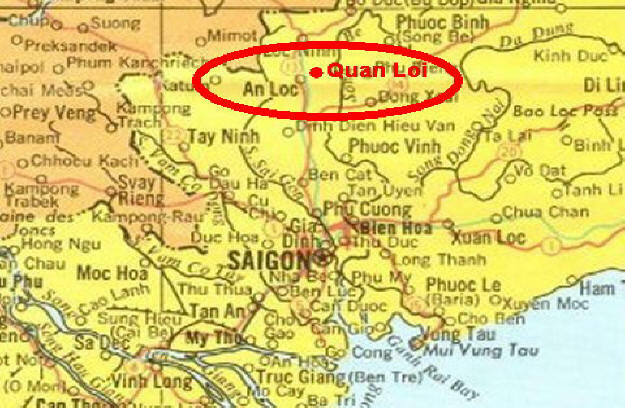 Subsequent to some uneventful weeks in and around the town of Trang Bang, we relocated to Hau Nghia Province which is due west of Saigon and is the area that sits between the “Parrot’s Beak” and Saigon. During Tet of ’68, the VC streamed over the border from sanctuaries in Cambodia thru the “Parrot’s Beak” to hit Saigon and Bien Hoa. 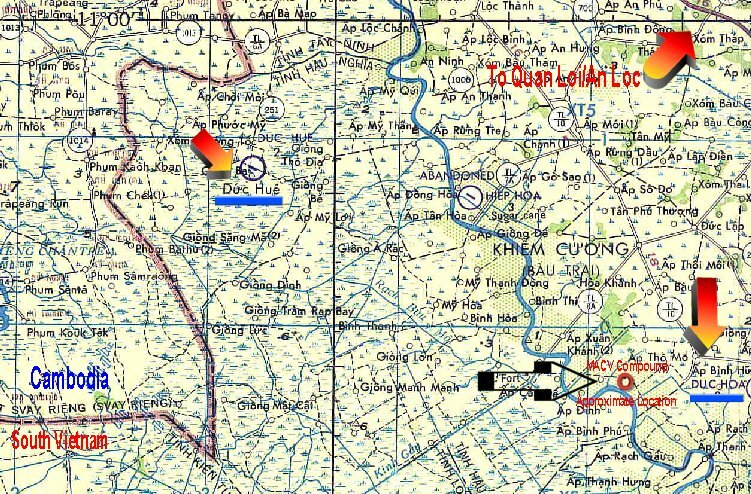 We were headed for the large hamlets of Duc Hoa and Duc Hue. Duc Hue was situated in an area surrounded by rice paddies and canals and what land was not under cultivation was wet lowlands and marshy. In contrast, Duc Hoa was a little higher in elevation and its rice paddies were, for the most part, dry. I recall that it was just after the harvest and the dry paddies were just rows and rows of stubble left by the harvesting of the rice crop. We were based out of the local MACV compound that was large enough to house a number of homes occupied by civilians who were a part of the MACV Regional/Popular Forces (“ruff-puffs”) and their families. The MACV advisers were housed in a large, two story white stucco home with a red tile roof. We took up temporary accommodations wherever we could find them, and together with about five other troopers I found shelter in a storage area under a staircase that led to the second floor of the MACV headquarters. Because Delta Company had been split up, my FO team was split. Lt. Harvick and Bill Knapp operated with one half of the company and I worked with the other half. Harvick’s half was located elsewhere and my half had the MACV compound. During this time, we worked joint day operations with the local RF/PF’s and also accompanied them on night ambushes. The night ambushes did not require our entire ½ platoon and we reorganized into reinforced, heavy squads and took turns going out on nocturnal maneuvers. The people left behind during the evening activities were left behind to catch up on letter writing, relaxing, sleeping or to do any domestic chores that had been neglected for some time. This leads to my story. The “stay behind” guys were expected to stand guard duty in and around the MACV compound together with a RF/PF “counterpart”. Typically guard duty began at 6:00 P.M. and lasted for two hours. Thus, the following time slots needed to be staffed: 6:00 to 8:00, 8:00 to 10:00, 10:00 to Midnight, Midnight to 2:00, 2:00 to 4:00 and 4:00 to sun-up. One of the least popular hours is the 2:00 to 4:00 hour. It comes early enough in the evening to ruin a “good night’s sleep” and late enough in the morning to give you just a short nap before sunrise. Being rather new to the company and low on the “totem pole” I was not given any choices and my first night of guard duty was the 2:00 AM to 4:00 AM shift. I turned in early that evening and it seemed like I had just closed my eyes when I felt my shoulder being shaken to get me up for my shift. I got up from the concrete floor cold and stiff and rubbed the sleep from my eyes and proceeded to feel around for my gear. Armed with the standard flak jacket, steel pot, one bandoleer of ammunition, my M-16 and one illumination hand-popper, I trundled off and found my way over to the concrete bunker that was on the southwestern side of the compound to meet my RF/PF counterpart. This entire side of the compound was bordered by the Song Vam Co Dong River and ran the entire length of the western side of the compound. I had gotten there before my counterpart and took up a position on the roof of the bunker and surveyed the area. The moon was still up in the western sky and illuminated the entire area and made visibility very good. The area in front of the bunker was the river and out to about six feet, was nothing but reeds. I was just lighting a cigarette when my counterpart showed up, a little late. Unlike me, he came with some unconventional equipment for guard duty in a neighborhood that was supposed to be 80% to 85% VC. He had no rifle or ammunition, no protective equipment (flak jacket or helmet) and no grenades. I’m armed for the work and this guy shows up like he’s going on a picnic. He did have a fishing pole and a bucket and I just had to shake my head. What could this guy be up to? He didn’t convince me that he was going to be around if the sh_t hit the fan and we had to defend our position. But, I wasn’t surprised by the relaxed attitude of my counterpart. After all, they had been fighting one war or another for generations or centuries and why should this one be any different than the last. He was probably pretty tired over the whole affair and for all I knew; he could have been the local VC commander. His relaxed demeanor put me at ease and using my flak jacket for a backrest; I sat back with my rifle on my lap and decide to just enjoy the scene. Having climbed onto the bunker, my counterpart moved over to the edge of the bunker and sat with his feet dangling over the edge. He placed his bucket next to him and baited his pole and lowered the line into the reeds in front of the bunker. I had done a lot of fishing while growing up in Hawaii and did a fair amount of fishing in Colorado while I was going to college. I was curious to see what kind of fish this guy was going to catch at night. In no time, he had something coming up and it was pretty lively. As best as I could see from my distance to him in the dark, it was about 6-8 inches long and skinny with an unusual jerky wriggling movement to it. I moved over to take a better look and recognized his catch as a freshwater, Malaysian prawn. He looked at me with a big grin and I grinned back. I decided, “What the heck” and put my rifle away and sat down next to him with a little hand net and started helping him with his catch. He fished nearly the entire two hours we were on duty and his bucket was pretty full of prawns by 4:00 A.M. Those were the quickest two hours of guard duty I had ever stood and when we finished for the evening, he invited me over to his house. I was a little leery about doing something like that but since his home was in the compound, I thought it would be alright. I still had to stow my gear away and wake up the next poor soul for their turn at guard and once having completed the “hand-off”, I headed over to the “buddies” house. When I knocked at his door, he opened it and he invited me in and introduced me to his wife who was standing near a table with a large pan of what looked like the prawns I had just seen not long before. The aroma reminded me of Indian curry and my “buddy” motioned me to a seat at the table. I should mention that he did not speak English and I did not speak Vietnamese but through sign language, body language and facial expressions we somehow communicated. The table was set with the curried prawns at the center and I was offered a large bowl filled with cooked, unpolished, brown Vietnamese rice. Some of the local crop no doubt and I enjoyed the texture and taste of the local rice. While eating the curried prawns over that wonderful rice, my “buddy’s” wife brought over two bottles of ice cold “33” beer and that really rounded out a very memorable breakfast. Our conversation during the meal was understandably minimal but through profuse “mmmmms” I tried to communicate my pleasure with the meal. Upon finishing the meal, we shared a cigarette and having thanked them, I made my way back to my unit that was beginning to make all the sounds of waking up. I had another smoke and a cup of coffee and watched the sun come up on a very full stomach. I don’t recall what I did that day but I didn’t have ambush that night and was going to be staying back at the compound again. When the platoon sergeant came around with the duty rooster for guard, I immediately volunteered for the 2 to 4 shift and he gave me a real funny look and remarked that since I had it the night before, I could take another time. Nope, I wanted that slot and he obliged. Again, like the night before, I turned in early, slept well and was awakened at the appointed time. I did grab all my gear and made it over to the bunker and before I could set all my stuff down my counterpart showed with not just his fishing gear but another set for me. He smiled, handed it over to me and took up his position on the edge of the bunker with his legs hanging over the edge. I took a place next to him and it didn’t take long for me to get the hang of “hooking” prawns and we had a pretty good haul in a couple of hours. Just like the night before, I went back to wake up the guard to take my place and drop off my gear and with a case of C-rats under my arm to thank them for the night before, I was off to my “buddy’s” house for some breakfast of curried prawns. The repeat of the night before was “too good” to last and the following day we moved out and I was never to see that fisherman and his wife again. I carry this fond remembrance with me after more then 32 years and I know it will stay with me till the day I die. I don’t even know the guy’s name or the name of his wife and my recollection of what they look like is rather faded but their hospitality and generosity is most clear in my mind. I don’t know much about the guy and knowing the statistics of the area, there’s a very good chance he was VC or a VC sympathizer. It really didn’t matter. We found we enjoyed each others company and shared an interest. We put the war aside and found quiet enjoyment in “hooking prawns” for just a few hours together.